Bubby and Bean ::: Living Creatively: Happy 15th Birthday Bubby! Yesterday was my sweet Bubby dog's 15th birthday, and I posted that I had something special in the works that I was creating to pay tribute. Here it is! (The end is the best, promise). Leary (Bubby's "real" name) has been my muse, inspiration, and greatest gift for the last 15 years, so I decided to make a little video in his honor. I could easily devote an entire series of novels to this magical, miracle dog, but instead I'll share a very abbreviated version of our history together. 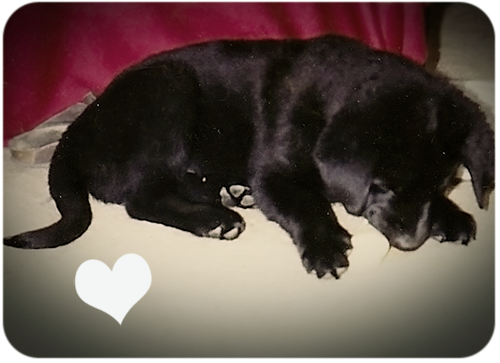 I'll never forget the moment I first saw him in Colorado, a black ball of Chow/Lab fuzziness, and immediately knew that we were about to share some remarkable adventures together. Since the day I graduated college and hit the road by myself to explore the country gypsy-style, Leary has been by my side. He's lived in 8 different states with me: Colorado, California, Oregon, Michigan, Florida, Pennsylvania, Indiana and Illinois. He's been my travel companion to everywhere from San Francisco to New York City to Miami to Canada, from Yellowstone to the Redwoods, from (and in) the Atlantic to the Pacific, and everywhere in between. He's worked with me in every studio and office I've ever had, and has even attended events where I've shown my work. And of course, when he and Robbie first met 4-1/2 years ago, Leary was the true test of whether this new boy would become a serious part of my life. It was love at first sight for those two, and the rest is history. Bubby and I have also been through the greatest challenges and tragedies of my life together. He's had his share of physical problems and medical emergencies, including a terrible vet who overdosed him on a medication from which he had horrific seizures and almost died. When he was 6 months old, he swallowed a fish hook attached to a line while swimming in a lake on top of a mountain, and had to have 6 feet of intestine removed. A few years ago, he was diagnosed with GOLPP, a neurological condition that affects everything from breathing to digestion to walking, and survived a risky surgery only to come out of it with a renewed energy and zest for life. He's also been by my side through incredibly traumatic experiences, including the suicide of my long-time ex and close friend last summer. Through all of this, Leary never stopped wagging his tail. I've had 6 dogs through my life, and I've loved them all dearly. Bubby, however, is my heart dog. It's both difficult and beautiful to see him grow so old. There is nothing as painful for me as seeing him struggle with things that used to be easy. 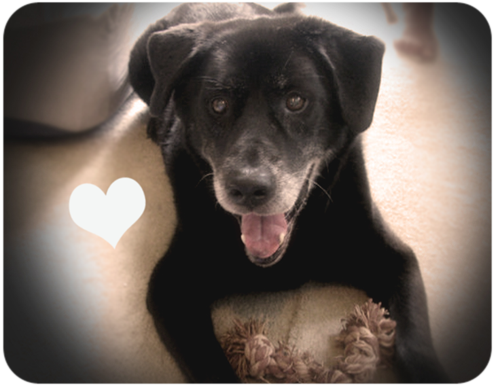 But there is also nothing as lovely as seeing this elderly animal, who would be close to 100 in human years, relishing sunshine on his face, attacking toys like a puppy, and showing complete elation when I walk through the door. He is a very, very special dog. I'm not sure whether or not this will be Leary's last birthday, but I know that I'll always smile when I think of how much he enjoyed opening his presents (one of his greatest talents) and eating the filet mignon his dad cooked for him as we sang happy birthday. I've been an animal lover since before I could talk, but I don't think I ever could have imagined that a dog could have this profound of an effect on my life. As I've said to him every night before we go to sleep for the last 15 years, "Leary, I've never loved anything like I love you." Happy Birthday sweet boy. UPDATE: On April 21st, our sweet boy was diagnosed with a very aggressive cancer and given "a few days to a few weeks" to live. I couldn't be more grateful that he was able to celebrate his 15th birthday last month. this post made me tear up a little! 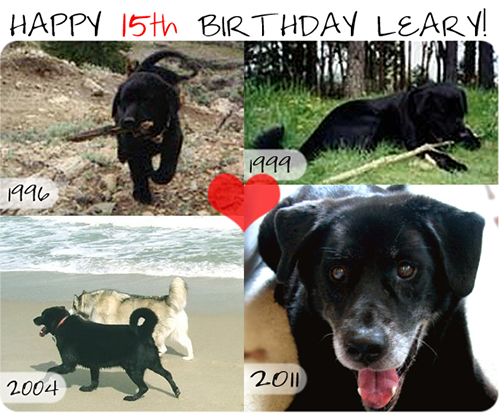 i wish dogs lived as long as we did, you are lucky to have your pup for 15 wonderful years, i hope there are many more! I am crying right now!!! What a beautiful, loving tribute to such a special boy! Thank you so much for sharing it with us. ok melissa are u trying to make us all cry? that was beyond precious! all of it, every single little piece. the pix, the video, the words.. Happy Birthday! What a great video.....I loved it. He looks so sweet:)I couldn't help to think about my Mattie, 5 year old yellow lab, when watching the video and reading the post. Happy birthday to your beautiful bubby! awww, it's so darned hard when our pets get older. Wish we could keep them young forever. This is such a beautiful tribute, so beautiful it made me cry! He's just absolutely precious and reminds me of my puppy, Franklin. Thanks so much for sharing! This is so sweet! My dogs are truly part of the family, and your so lucky to have Leary in your life. My Trudi was diagnosed with LP in February. I was so moved and inspired by your tribute to Leary. Trudi is going to be thirteen in May and she too is my heart dog. Thanks for sharing your wonderful story and thanks for letting us share in Leary's Birthday!!! Happy Birhtday Leary!